I'm going crazy; you come, too: Crazy quilter's poem: contest and give-away! 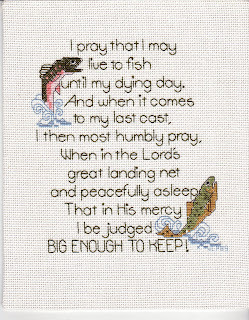 Have you ever seen this poem for fishermen (and women)? I pray that I may crazy quilt until my dying day. The last word should rhyme with "asleep", or "asleep" could be changed to something else that would rhyme with the last word. Help me finish the poem and I'll choose one winner to receive either a baggie of CQ stash or a finished CQ item, winner's choice. I want to give everyone a bit of time to think about this, so let's say you need to have your suggestion to me by January 23rd (leave a comment containing your suggested ending on this post or email me directly). Kick it around your brain for awhile and let's see what you all can come up with! I'm signed up to do a round robin with the theme of "words" and this little poem would work up perfectly....if only it gets a good ending! Thanks for your help! entitled my stash to keep!" Who says you can't take it with you!!! for the company that I keep! That in His mercy I be judged..
my just rewards to reap!" and pulled in his loving arms for everlasting sleep. I pray that I may crazy quilt until my dying day.. I won't have to worry about being judged by all the needles that I bent. "By the threads I did not keep"
with all my other peeps. as a stitcher who was blessed. Here's one Janet: I pray that I may crazy quilt until my dying day. And amongst the greatest stash tis known is where I will abide. Her'es another attempt: I pray that I may crazy quilt until my dying day. My everlasting placement amongst the Heavenly stash on high. Heres one more that I've been playing with. Maybe you can come up with just the right wording. My everlasting blessing is to be one who forever sews. That in his mercy I be judged as "green"
For all the recycled items out of the landfill I did keep!